This article demonstrates how to create Elasticsearch documents with NESTED objects using jQuery, jTable and moment.js in the MVC Razor View, and using MVC, ElasticsearchCRUD and Elasticsearch as the backend. The SearchController provides all CRUD Actions so you can experiment with the 1 to n entities, or the Elasticsearch nested documents. Not all Elasticsearch clients provide a way to view documents with Nested objects. The model used to interact with Elasticsearch has a 1 to n relationship. The class SkillWithListOfDetails has a list of SkillDetail objects. These classes will be saved to Elasticsearch with the SkillDetail list as a nested object. 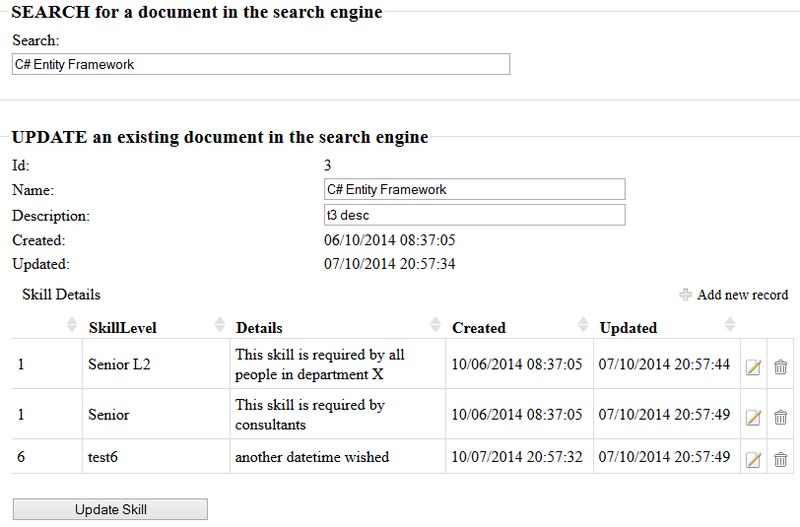 This child object can be search just like any other property in the parent object, SkillWithListOfDetails. The SkillDetail is used as the child class. No Id is required for the parent foreign key, because the child is NESTED when stored to Elasticsearch. This uses the default IElasticSearchMappingResolver which saves the index pluralized, sets the type to the class name without the namespace and also saves all properties to lower case. An id is required and is not auto generated. Auto-Generated Ids is not supported by ElasticseachCRUD. Usually Elasticsearch is not the primary persistence and the entities which will be saved to the search engine as documents already have an id. If an Id needs to be created, you could Auto-Generate a new random Guid. When you check the mapping in the Elasticsearch search engine, you will find the new document with the nested array of child items. The search is built using the search class which contains a query string search. This query takes wildcards which can be used for the autocomplete. This could be optimized by using a different query type. The term is split into different search terms with a * wildcard at the end of each. The search also searches the nested arrays. The search is then used in the SearchController. This returns the collection as a Json array with is used directly from the autocomplete control. The autocomplete control uses this Json result and allows the user to select a single document. When a document is selected, it is displayed in the update control. moment.js library is used to display the Json DateTime items in a readable format. The items are then used in the jTable and the input forms. The update method takes the received data from the view and updates all the Updated timestamps. The child SkillDetail list is added to the entity and this is then updated in Elasticsearch. The delete method uses the _id filed to delete the document. 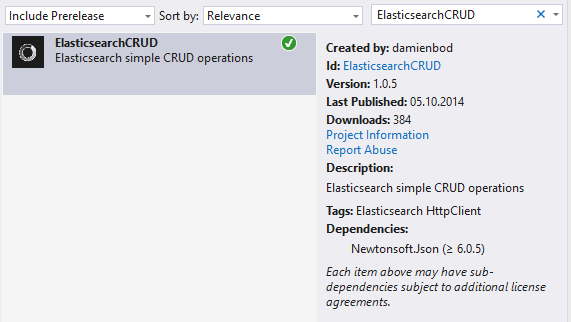 Using ElasticsearchCRUD, it is super easy to add, update, remove documents with 1 to n relationships. The child elements are nested in the parent document. Collections or arrays of objects as well as simple type collections/arrays are supported. Using Elasticsearch with ElasticsearchCRUD, you can create complex search queries. How do you delete only Nested document instad of deleting the entire document. Could you please share the code to do.